This fund exists to support campers and counsellors who are not able to afford their summer camp or retreat fees. It is important that all young people who are interested in attending have the opportunity to grow in their faith and build community with other Catholic Christians by attending retreats and summer camps. ​All donations are important and appreciated. General donations give us the flexibility to allocate money to the area of greatest need. Donations can be made online or by cheque and tax receipt will be issued for donations over $20.00. If you have these or any other items that you think camp might be able to use please contact the camp office by phone or email. Thank you! ​Some of our sheets in need of replacement and we like to have 2 full sets of sheets per bed. The donation of new or gently used twin sized fitted sheets will help keep our campers’ rooms looking their best. One room has beds for 10-12 campers. ​We are looking for a new or newer commercial meat slicer to replace our aging slicer. It does need to be a commercial sized slicer in order to manage the size and quantity of roast and other meats that we serve in a week! ​We like to keep camp looking its best. We are in need of a new heavy duty gas powered weed wacker to keep up with our fast growing lawns. ​New binders, printer paper, file folders, business envelopes, pens, pencils, markers, post it notes etc. are always needed. ​We like to play music during games, meals, talent night etc. We are looking for an IPod that we can have our music on that is portable. During Adoration, Campfire, Mass it can be very low light for the musicians. We are looking for a light that can be clamped onto a music stand to allow the musicians to see the music they are playing. ​Donations can be sent to the camp office as paper money or as a gift card to save postage. 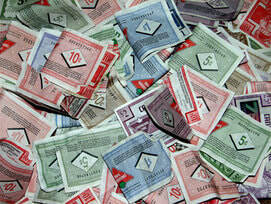 Most Canadian Tire stores will put Canadian Tire money onto a gift card if you bring it to customer service. Donations can be made online by clicking on the link provided above which will link you to the online donation page for Archdiocese camps. Under choose fund you may choose to support Our Lady of Victory Camp through a general donation, to sponsor special projects or to help send campers and counsellors to camp by supporting our campership fund. You can choose to support OLVC with a one-time gift amount of your choosing or to enrol in our monthly giving program. Please note: All funds donated online or by cheque for OLVC are receipted by the Catholic Archdiocese of Edmonton but are fully allocated/ received by Our Lady of Victory Camp. Thank you for supporting OLVC!